Batman Solo Movie Getting Will Smith's Deadshot? Next year, Warner Bros. kicks off their DC Comics Extended Universe (DCEU) with Batman v Superman: Dawn of Justice, which brings both Batman and Superman together on the big screen for the first time. We reported in July that Warner Bros. is so pleased with Ben Affleck's work as The Dark Knight that they have brought him on to star in and direct a new Batman Reboot, while co-writing the script with DC's Geoff Johns. 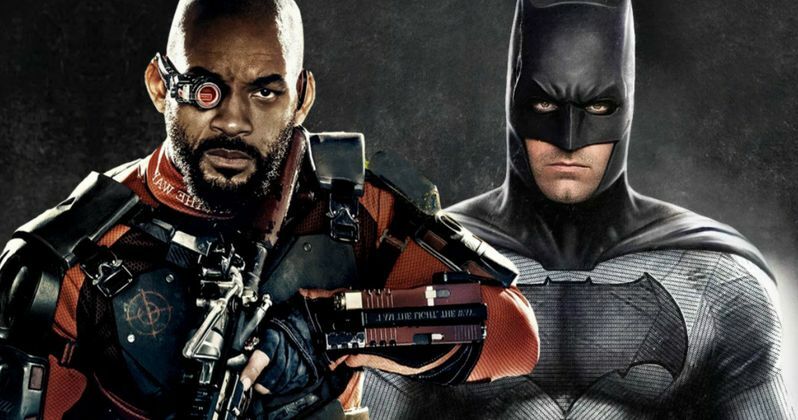 Today we have a new report from Latino Review, which claims Batman may get some company, in the form of Will Smith's Deadshot from Suicide Squad. Nothing is official yet, but if a deal is made, Will Smith will reportedly have a "major role" in what's being described as a "The Good the Bad and the Ugly scenario." The actor is reportedly excited about being part of a larger cinematic universe, and he has already signed on for multiple appearances as Deadshot in the DCEU. All of the parties involved are reportedly "enthusiastic" about the actor signing on, so perhaps we'll hear something official in the near future. Ben Affleck's Batman will be featured in Suicide Squad, as we saw in numerous set photos and a brief appearance in the first trailer. Batman was seen hanging off the roof of The Joker's (Jared Leto) sports car in the trailer, but it isn't known if he will interact with any other members of the Suicide Squad, such as Deadshot. Still, The Dark Knight's presence in Suicide Squad could be more than enough to bring Deadshot into this Batman solo adventure. After the news broke of this Batman Reboot, another rumor surfaced that Warner Bros. actually wants the actor/director to make a stand alone trilogy of Batman movies, but that hasn't been confirmed yet. It isn't known if there are plans for The Joker to come aboard as well for this solo outing. In the second Batman v Superman: Dawn of Justice trailer, Bruce Wayne is seen gazing at the costume of his slain sidekick Robin, which featured a message painted on the suit that appeared to be written by The Joker himself. Will Smith will next be seen in Concussion, opening in theaters on Christmas Day. The actor is also expected to return for Bad Boys 3, which Sony recently set for release on February 17, 2017, and there is talk that the actor may also return for Men in Black 4. Warner Bros. hasn't officially set a release date yet, but since the studio already has a slew of superhero movies lined up through 2020, it's possible we may not see this Batman Reboot until 2021, or later. What do you think about Will Smith's Deadshot joining the Batman Reboot?